Beautiful 4 bedroom getaway on a beautiful golf course with approximately 2.5 acres. Stunning vaulted beamed ceilings, knotty pine walls and brick fireplace in living room. Custom kitchen/dining areas with 1/2 log siding and door wall leading to large covered deck. 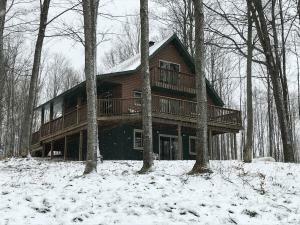 Easy access out to mother nature in the lower level with walk out finished basement and family room, additional fireplace, bedroom and bathroom. Central air conditioning is also a plus.